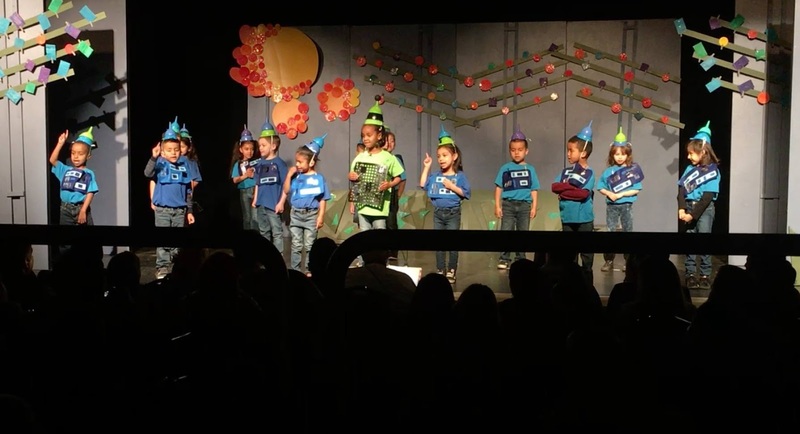 A few months ago, I overheard Mike Boston, the director of my son's theatre group, say that each year he adapts a classic picture book for kindergarteners to perform at Trace Elementary in San Jose where he teaches. I sheepishly mentioned I was a local writer and he could use one of my books. Mike's eyes lit up. "Let's do it this year!" he said. Cut to February 28. Sitting with my wife and kids at the Hoover Theatre, our jaws dropped as we watched 90 adorable kinders fill the stage and perform musical adaptations of Bitty Bot, Watersong, and Barnyard Boogie. Each book was hilariously played out in costume and capped off with an original song written and adapted by the school's music director, Jo Anne Warburton. If that weren't enough, the finale was a bouncy number titled "Hey There, Mr. McCanna." I was floored. Music and theatre are near and dear to my heart, and it was such a wonderful experience to see my children's books used to inspire such fun and creativity on the stage. Many thanks to Mike, Jo Anne, and the talented kids at Trace Elementary. Click here to watch a highlight video.